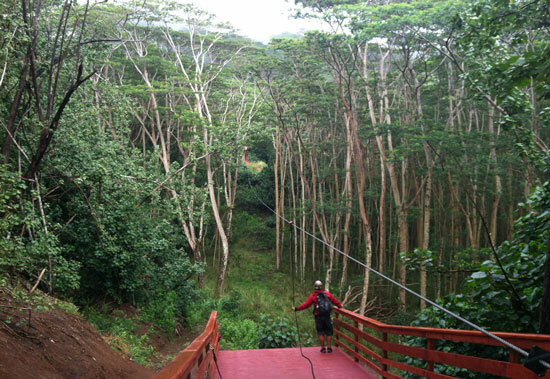 Koloa Zipline Tours has eight different ziplines at Grove Farm in Kauai. I can see the rain coming toward me, moving across the valley in a thick moving mist. I’m standing on a platform high above the Hawaiian rainforest, firmly strapped into zipline gear. The zipline before me stretches more than 2,500 feet across the lush green forest, and I can barely see my family, who are waiting for me on the other end of the line. Just as I jump off the pad, the rain hits. But it’s soft Hawaiian rain, so it’s warm and doesn’t sting. Rather, rushing through the misty drops simply adds to the thrill. It’s not every day you get to zoom through the rainforests of Kauai in the rain. Koloa Zipline Tour is the newest zipline tour in Kauai, and it’s been a huge hit with our family of five. With older teens, we were looking for a little adventure, and Koloa Zipline’s 8-line course certainly fits the bill. We spend almost four hours zipping across the tree tops, above a reservoir and across the valley. By the end of our adventure, we’re tired but happy. Many families have a favorite vacation destination. My parents like the farmlands of the Midwest, while others dream only of Europe. Over the years, Hawaii has become a clear favorite with our family. The laid-back Hawaiian style allows us to relax and unwind, and the lush greenery and ocean fun is different from our home near the Colorado Mountains. Each time we’ve visited Hawaii, we’ve had a very different vacation experience depending on the kids’ ages. When they were preschoolers and gradeschoolers, the kids just wanted to run on the beach. The water delighted them. They learned to snorkel in the protected bays of Maui and built sand castles on the broad beaches of Waikiki. When they got older, we explored more remote areas of Hawaii, visiting macadamia groves and hiking to the Green Sand Beach on the Big Island. Now they’ve grown into teens and young adults. At ages 15, 18, and 21, they don’t jump in the water or build sand castles any more, but they still love snorkeling, lounging on the beach and outdoor adventure. So on this trip, we’ve chosen to go to Kauai. The island’s nickname, the Garden Isle, can be a bit misleading. It’s true that Kauai is fertile and green, filled with colorful flowers, rainforests, and gorgeous scenery. But “Garden Isle” sounds a bit sleepy — and Kauai is a Mecca for outdoor adventure. The author with two of her children at Hanalei Valley Lookout. Our zipline adventure is just the beginning of our fun in Kauai. Sailing along the Napali Coast at sunset is a must-do for anyone visiting the island, and so that’s what we do next. We choose a sunset cruise with Holoholo Charters. The four-hour trip will take us to the tip of the island and back. The Napali coastline is rugged and wild, and sailing is the only way to see this stunning part of the island. We see whales and dolphins as we sail, listening to the captain’s stories of the ancient Hawaiians who once called these remote valleys home. The sun begins to set as we turn around and head for home. The crew serves a simple, but filling on board dinner on the way back. We snap a family photo as the sun sets over the ocean. It will eventually find a home on our wall. Later that week, we paddle down the Hanalei River with Kauai Kayak. Once again, there is a light rain. But the river is still smooth as we make our way along the river. Our guide tells us stories of life in Kauai, with tales of local lore and even some of today’s island gossip. It’s an inside look at Kauai that we would otherwise miss. Eventually we reach the open ocean, and the surf makes us paddle harder as we try to follow the shoreline. Finally, we pull the kayaks ashore and grab snorkel gear. The water is clear and blue as we snorkel the tropical reefs of Hanalei Bay. Two huge sea turtles drift in the waters alongside us, paying us no mind as they munch on the ocean’s bounty. 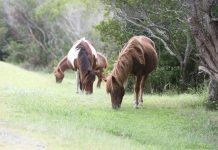 We watch from a short distance, awed by their size and grace. The snorkeling is good in Kauai, and it’s one of our favorite activities. One day, we pack a picnic and head to Poipu Beach Park, which is a good option for families. The park’s protected bay has excellent snorkeling, and there are lifeguards, bathrooms and showers. 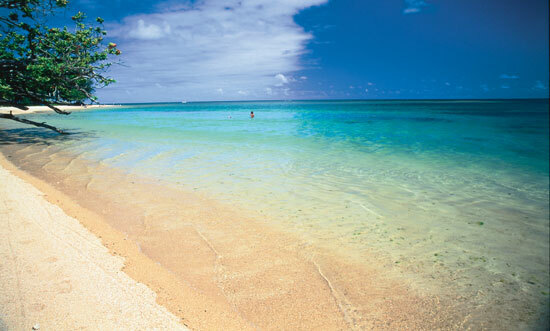 Another day, we head to Anini Beach, which has the longest reef on Kauai. The water near-shore is shallow, and the underwater canyons at reef’s edge are brimming with life. Be sure to note that in Kauai, it’s best to swim and snorkel on the north shore during summer and on the southern shore during the winter. Kauai is filled with top-quality hotels and B&Bs. However, we’ve found that it’s cheaper and a little easier to stay at a condo or apartment vacation rental. That way, you can cook your own meals, which saves money, and you don’t have to spend so much time in search of a place to eat. Plus, a vacation rental or condo provides a place for the family to relax, play games and simply spend time together. There are many timeshare rentals in Kauai, and this is a good option for a timeshare owner. However, keep one thing in mind — you’ll need to book far in advance. Hawaii is a popular destination, and to have the best options, plan on booking at least six to 12 months ahead. Be sure to check out reviews from other timeshare visitors. Just because the location is in Kauai doesn’t mean that the property is paradise. We found a few timeshare locations in Princeville that were located right on a busy parking lot or road, which doesn’t make for a quiet or peaceful stay. There are hundreds of vacation rental properties in Kauai available through VRBO (Vacation Rental By Owner). Each one is unique. Some are lovely; some haven’t been updated since the 1980s. Be sure to do your homework and check out visitor reviews. VRBO properties can be very cost effective, and are certainly a good option if budget is your top priority. Tripadvisor Rentals are another good option. Their site lists more than 8,000 options in Hawaii. Vacation villas, such as this one at Koloa Landing Wyndham Grand Resort, offer a place for the family to relax and spend time together. Several resorts offer luxury vacation apartment rentals in Kauai. Most provide top-quality accommodations in excellent locations near or on the beach. Two of our favorites are the Westin Princeville Ocean Resort Villas and Koloa Landing Wyndham Grand Resort. 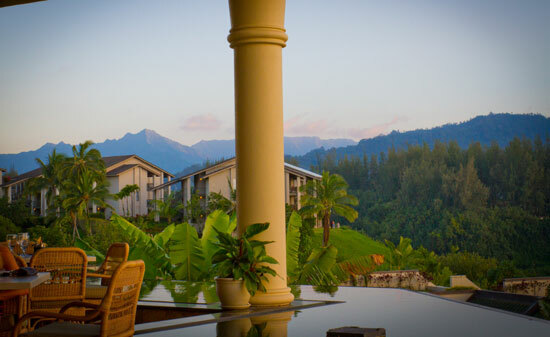 The Westin Princeville Ocean Resort Villas has an enviable location 200 feet above the Pacific along Kauai’s North Shore. Anini Beach is just a short walk away, offering protected waters suitable for the whole family. The Westin Princeville Ocean Resort Villas has a variety of villas, including studios, one-bedroom and two-bedroom villas, each with their own lanais. The two-bedroom we stayed in was large and roomy, just perfect for our family of five. The villas are modern with all the latest entertainment technology, and decorated with authentic touches of Hawaiian culture. Our kids tried out each of the resort’s four large pools, while I preferred the view of the ocean. Though we cooked our own meals in the large villa kitchen, we did take time out for a very enjoyable meal on the open terrace at Nanea Restaurant & Bar, their signature restaurant. Koloa Landing Wyndham Grand Resort is another excellent option for families. This new resort is located on the island’s sunny southern side near Poipu Beach. This area is convenient to the airport and to many island activities. 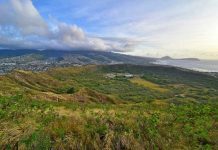 Koloa Landing’s location is quiet and away from traffic, but is just a few minutes’ drive to dining and shopping. Like many resorts in Kauai, the resort is filled with beautiful flowers, waterfalls and green foliage. Each of the resort’s 85 villas have large lanais, and many of them have excellent views of the ocean. 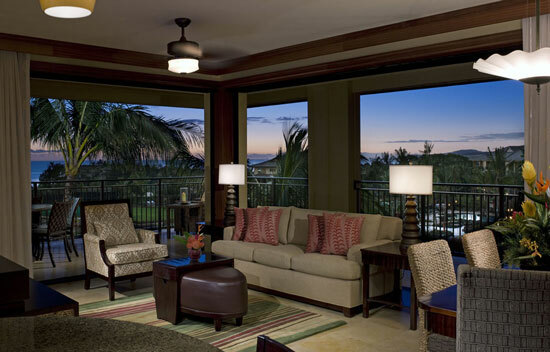 Koloa Landing Wyndham Grand Resort has some of the largest vacation villas on the island, with one, two, three, and four bedroom villas ranging from 1351 square feet to 3664 square feet of interior and exterior living space. We enjoyed cooking in the huge kitchen and then having our meals on the lanei, often cooled by a soft ocean breeze. One morning, we came out to find a huge double rainbow going from one end of the resort to the other. Dining is Kauai is not inexpensive. Even a meal at one of the popular local food trucks will set you back around $12/plate. The good news is that there is no shortage of excellent dining options on Kauai, from small local establishments offering “Blue Plate” lunches (specials of the day) to top restaurants with international acclaim. One of those top dining experiences can be found at the Makana Terrace at the St. Regis in Princeville. The outdoor patio overlooks Hanalei Bay and the Makana Mountains, and it’s known as one of the most romantic dining spots on the island. One evening, my sweetheart and I leave the kids at the resort, and enjoy a relaxing dinner at Makana Terrace on our own. The sun is just starting to set as we savor bites of Macadamia Nut Crusted Mahi Mahi and Sake Soy-Glazed Butterfish. The entire evening is magical. The romantic setting at Makana Terrace in Kauai. The kids’ favorite restaurant turns out to be Keoki’s Paradise. It’s a popular place near Poipu Beach, and there’s usually a long wait. We choose to dine outside on the bar patio. There’s a much shorter wait and a more affordable casual menu, plus a lovely garden-side outdoor setting. While we enjoy every meal out in Kauai, cooking at our vacation rental is just as rewarding. Kauai has so many fruits, veggies and foods that we don’t have back home in Colorado, and we have a great time sampling these yummy foods. Shopping at local grocery stores is always one of my highlights while traveling. Why? It’s one of the best windows into the local culture. A quick trip through Walmart in Lihue, for example, reveals a huge section of Spam (the Hawaiians love their Spam, and there are numerous varieties), a huge case full of flower leis, and a massive aisle of fireworks (yup, they are legal here). Walmart is also one of the best places to buy snorkel gear, beach chairs and a cheap cooler for your picnic lunches. Some of our favorite grocery store finds are the local juices made from guava, star fruit, mango and other fruits. Hawaiian supermarket delis are also a treasure trove, filled with local favorites like poke. Poke is the Hawaiian version of Japanese sashimi, which is bite-sized pieces of raw fish doused in seasonings. The fish in poke is sometimes lightly seared or fried. Stop in any Hawaiian grocery store, and you’ll find numerous types of poke to choose from. Kauai is not large, but it does take a while to get from place to place. You might want to plan your shopping outings carefully. There is a Foodland in Princeville, which is quick and convenient, but a little pricier. We prefer shopping at the Safeway in Kapaa, the Big Save in Poipu and the Walmart in Lihue. When is the Best Time to Go to Kauai? 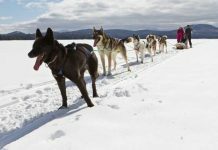 Airline tickets and hotel prices are more affordable from September to early December, and then again from after New Year’s through spring break. Prices go up when children have school vacation (spring break, Christmas break and summer time) and there is more demand. Plan ahead, and you can make your Hawaiian vacation budget go further. Protect Your Travel Investment From The Unexpected With Allianz Travel Insurance. Compare Plans & Buy Today.